Whenever pos­si­ble, Klasmann-Deilmann gives assign­ments with a dif­fe­rence to young peop­le doing voca­tio­nal trai­ning and stu­dy pro­gram­mes. The­se inclu­de a cur­rent pro­ject on dro­nes invol­ving five stu­dents. They are using the latest infor­ma­ti­on tech­no­lo­gy to deve­lop a method that deli­vers extre­me­ly pre­ci­se quan­ti­ta­ti­ve assess­ments of stocks in extrac­tion are­as. Wea­ther con­di­ti­ons are favoura­ble. It’s sun­ny with almost no wind. Five stu­dents have dri­ven out onto one of our extrac­tion sites. Their dar­ing mis­si­on: a test flight with a dro­ne. On a level sur­face wit­hin the Ost­feld peat­field, they place the qua­dro­cop­ter on the ground. Befo­re take­off, they enter the desi­red alti­tu­de in the con­trol tablet and set the inter­vals at which the inte­gra­ted came­ra is to take pho­tos. The minia­tu­re air­craft, weig­hing some 1.5 kg, takes off, clim­bing steadi­ly and reaching an alti­tu­de of 80 m. The stu­dents watch, trans­fi­xed by this tech­no­lo­gi­cal mar­vel. Then the qua­dro­cop­ter starts its for­ward move­ment high above the 500-odd-met­re-long peat stack. “It makes five pas­ses over the stack in dif­fe­rent posi­ti­ons to take pho­tos with a high degree of over­lap,” exp­lains Lars Wortel­bo­er. Two years ago Lars began a com­bi­ned voca­tio­nal trai­ning und degree pro­gram­me in Lin­gen, doing Busi­ness Infor­ma­ti­on Sys­tems at Osna­brück Uni­ver­si­ty of App­lied Sci­en­ces (HSO). He is assis­ting our IT team during his prac­ti­cal-trai­ning pha­ses. The­se dro­ne flights are part of a stu­dy pro­ject. As the group con­sists of pro­s­pec­tive IT spe­cia­lists and busi­ness admi­nis­tra­tors, a topic had to be found at the inter­face bet­ween the­se two are­as. “When Klasmann-Deilmann sug­gested working with a dro­ne, we leapt on board strai­ght away,” says Niklas Albers. He had alrea­dy qua­li­fied with us as an Indus­tri­al Busi­ness Admi­nis­tra­tor and, buil­ding on this, is now doing a com­bi­ned degree and voca­tio­nal trai­ning cour­se in Busi­ness Admi­nis­tra­ti­on. It was not hard for Lars and Niklas to per­sua­de fel­low HSO stu­dents based at Lin­gen to sign up for this qua­dro­cop­ter dro­ne pro­ject with Klasmann-Deilmann. Lars, Niklas and the others are sup­por­ted by pro­ject super­vi­sor Hen­ry Hurink. Pro­ces­sing data obtai­ned by dro­nes is part of his rou­ti­ne dai­ly work invol­ving the taking of site mea­su­rements for our cli­ma­te foot­print. So his expe­ri­ence is inva­lu­able to the stu­dents. The task now is to iden­ti­fy the best method of deter­mi­ning the volu­me of extrac­ted peat as pre­cise­ly as pos­si­ble. “We’re still doing a lot of try­ing out and tes­ting at the moment,” says Niklas. “The hig­her the dro­ne, the bet­ter the over­view, but the accu­ra­cy may be com­pro­mi­sed above a cer­tain height.” When, star­ting in Febru­a­ry, the raw mate­ri­als are suc­ces­si­ve­ly loa­ded onto the rail­way cars and the true volu­me can be deter­mi­ned with refe­rence to the num­ber of wagons, the young inves­ti­ga­tors can com­pa­re their figu­res with the actu­al quan­ti­ty. 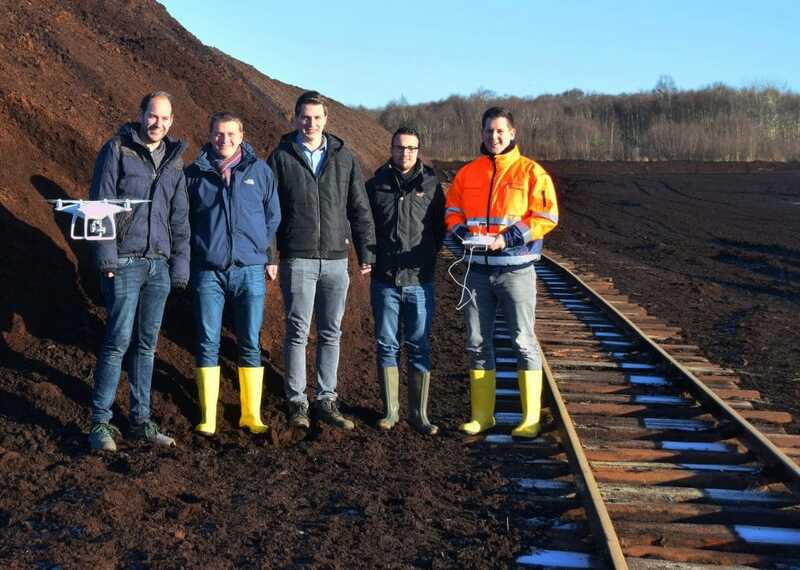 Doing their stu­dy pro­ject on the use of a dro­ne for stock­ta­king pur­po­ses (from left): Tim Fiet­zek, Niklas Albers, Marc Sche­per, Jonas Smo­la­rek and Lars Wortel­bo­er.